A horse can’t relax with his head held high, so getting him to lower his head while trotting helps relax his entire body. Done correctly, this prepares your horse to get on and accept the bit. When this happens, his head is down and relaxed, his abdominal muscles are lifted so you feel his back rounding under your saddle, and his pelvis is tucked with his hind legs underneath him, propelling him from his hindquarters. Trot your horse without contact so he can stretch out his neck and body. This means your reins are long enough so that you don't feel any pressure, or contact, in your hands from your horse's mouth at the end of the bridle. It should almost feel as though you are riding with no hands -- but you don't need your reins to be quite that long. If you are riding English, you can ride on the buckle that connects the two rein pieces in the middle or a little shorter. If you are riding Western in a leverage bit, which has shanks that hang down from the corners of the bit where the reins attach, make sure the reins are long enough so they don't engage the leverage action of the shanks. Leverage occurs when the shanks tilt inward when you pull on the reins. Begin asking for a bend in his ribcage around your inside leg in the direction you are going. For example, if you are traveling left around the arena, your inside leg is your left leg. To ask, apply light pressure with your inside leg to encourage him to bend. Ask for slight lateral flexion with the inside rein by opening it away from you slightly. Work your horse in very simple bending patterns. Start with large circles, then vary the size of the circles. Serpentines -- snakelike patterns across the arena horizontally -- are also good bending exercises. Add your outside rein for balance. Place slight pressure on the rein by pulling it toward your hip. This balances the horse to keep him from turning to the inside while you are using the inside rein. At the same time, bring your horse back into the bridle by squeezing him forward with your legs and taking up light contact with your reins. You should feel contact with his mouth because his hind legs are reaching underneath him, his back is rounded with uplifted abdominal muscles and he is propelling himself forward into the bit and bridle, lifting his shoulders and flexing his poll -- thus creating a lower headset. 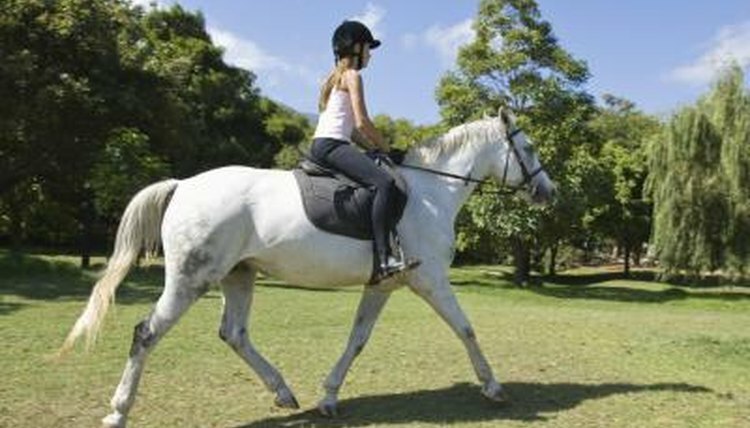  Transitions between gaits also encourage softness in your horse that allows him to lower his head. Good transitions are walk to trot, trot to halt, walk to canter and canter back down to the walk.  As your horse's hind end and abdominal muscles develop, he can keep this fully engaged position for longer periods of time. ⚠ Don’t pull on the reins or make them excessively short to try to encourage your horse to lower his head. Your horse may learn to evade the constant pull by going past flexion -- drawing his nose inward to his chest -- to get “behind” the bit. When he does this you have no control with the bridle or bit. ⚠ Never use artificial devices such as martingales or tie-downs to lower your horse's head if he doesn't understand all of the concepts. He will be using his muscles incorrectly, potentially causing long-term problems.